Transplanting is a large labor user in greenhouses and nurseries. Every effort should be made to make it as efficient as possible. Transplanting can be done either in the greenhouse where the plants are to be grown or in a separate area usually a headhouse. For the small grower with separate freestanding greenhouses, it is usually most convenient to work right in the greenhouse. Seedlings and flats are supplied to each greenhouse as needed. To save labor and time, prefilled flats or pots can be brought in stacked on pallets. For greenhouses where the flats are grown on the floor, movable potting benches on wheels work best. 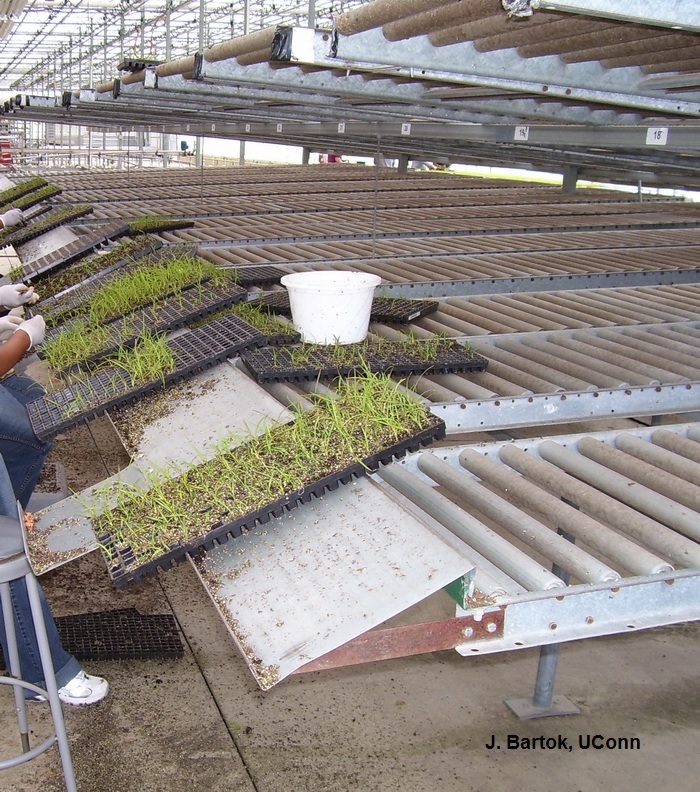 Seedlings are transplanted into the flats which are then placed directly onto the growing space on the floor. The potting bench is moved from one end of the greenhouse to the other as the space is filled. One key to efficient transplanting is to have materials and seedlings handy. Time spent walking, reaching or looking for materials adds costs. Locate flats as close as possible to employees’ work stations. Reduce the amount of walking that the transplanters must do. A 10 foot round trip to pick up a flat costs about 2 cents. Doing this many times a day adds to the cost of the plants and tires workers. Transplanting is easier if good dibble holes have been formed in the growing medium surface of the flat. This requires proper moisture content that varies with the type of growing mix used. Experimentation will indicate that level. Generally a central transplanting area is more efficient if the greenhouses are connected to a central headhouse. Having all materials and workers in one area reduces materials movement and makes supervision easier. A permanent set-up may include the media preparation, container filling equipment and workstations or a transplanting conveyor. Movement of the transplanted plants can be with carts or a conveyor system. A workstation is an area where an employee does a series of repetitive tasks; for example, transplanting, potting or preparing cuttings. The layout of this area can have a large influence on the efficiency of the work that is accomplished. Basic principles of workstation design and layout have been developed based on time and motion studies and these have been applied to many industrial operations and tasks. These same principles can be used to improve many of the tasks associated with growing plants. A reduction of 20 to 30 percent in time is often the result. A drawing should be made on graph paper to scale to develop the best layout. It should include the location of the worker, materials and tools. The best table height is elbow height. Adjustment should be provided for different size workers. It is best to provide for both standing and sitting positions as greater efficiency is achieved when workers change positions. Elbow height should be measured in the standing position. Height adjustment in the chair or stool can bring the worker up to the standing height level. Comfortable chairs with back and foot rests will create less fatigue. Where possible, both hands should operate as mirror images and both be working at all times. Holding something in one had while the other hand is performing a task is not very productive. If reaching for plants or other things, the distance should be the same for both hands. Continuous or curved motions are the most natural and productive. Start and stop motions require more energy and time. The reach from the normal arm rest position should be limited to 24” radius to the side and front for women and 27” for men. Assembly area is best within 16” to 18” of the resting elbow position. A space of 3’ x 3’ is normal for the worker unless a wider work area for supplies is needed. Space to the rear should be left for movement of workers and materials. Adequate lighting over the work area will increase efficiency and reduce eye strain. It should be located above the workstation so as not to create shadows. A level of 40 to 60 foot-candles is necessary. Materials should be located as close to the work area as possible. The farther you have to reach for something, the more time it takes. Tipping a plug flat toward the transplanter can reduce the distance by as much as 10”. Plugs should be dislodged to effect easier removal. Locating a dibble board in a permanent holder will locate it so the worker does not have to look to retrieve it. Prefilled containers from the flat or pot filler are best conveyed to the work area. A belt conveyor with an accumulating station works best. Gravity should be used wherever possible. A conveyor located in front of the transplanter is best for sending a transplanted container on its way to the greenhouse. The flat or pot is just pushed onto the conveyor. Alternate locations are underneath the workstation bench or behind the worker. This involves moving or turning which takes more time. If carts are used, they should be located as close as possible to each worker. Inexpensive brackets, fixtures or supports can be used to hold materials in position while they are being worked on. This frees up one hand that would normally be required for support. Putting the above principles into practice in your operation can reduce worker fatigue and increase production output. Most greenhouse and nursery operations have one or more potting tables. This is a bench with a work surface at a convenient height for potting or transplanting. These can be either fixed or portable. The addition of shelves above and below the work surface can be used for storage of containers tags, dibble and other things needed. Potting wagons have a body for soil and hinged sides that drop down to form a work surface. This provides easy access to the growing mix. They are frequently used where potting is done in the field or outdoor nursery area. The wagon should have large pneumatic tires for easy maneuverability and be narrow enough so that it is easy to reach the soil in the middle. Mechanical potting machines usually contain a soil hopper that holds one or more cubic yards of mix, a conveyor that lifts the soil and drops it into the pots, a pot conveyor with holders for each size of pot and controls that regulated the speed of the conveyors. Accessories that may be added include pot dispenser, soil compaction and leveling devices, dibble or drill for the plants, return conveyor for excess soil and a take-off conveyor for planted pots. Machines are available that will handle containers from 2.5” to 21” diameter. The machines fill and prepare the pot and transplanting is done by employees as the pots pass in front of them. The concept is adapted from assembly operations in the electronics and appliance industries. 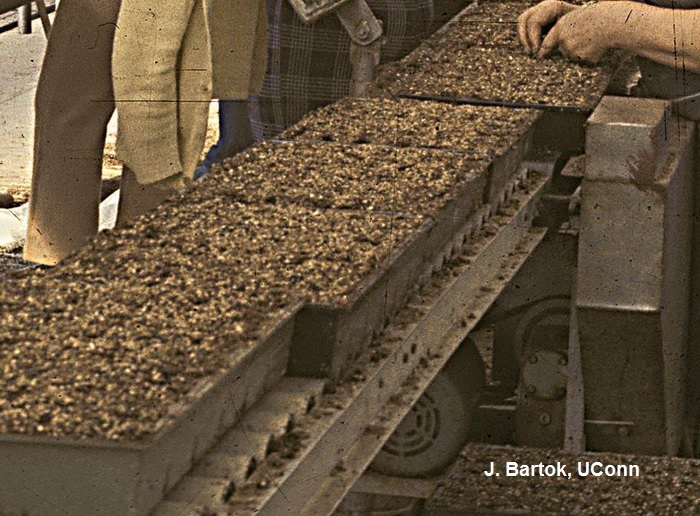 A slow speed conveyor belt moves the predibbled flats or pots past workers who place the plugs or cuttings. The workers stand or sit next to the conveyor with the plugs located within arms’ reach. A variable speed motor on the conveyor adjusts the speed from 5 to 50 ft/min to adapt to the type of container, the number of transplants and the experience of the workers. A transplanting conveyor can work in conjunction with a container filling operation although prefilled flats could also be loaded on to the conveyor, one at a time. The conveyor speeds the transplanting operation by eliminating worker movement and by setting the pace. Transplant conveyors are available in several widths, 8”, 12” and 18”, and in lengths to accommodate 4 to 24 workers. Tray supports are usually adjustable to accommodate the worker needs. Wheels to move the conveyor can be provided if portability is required. A counter can also be added to keep track of the number of containers completed. Once the containers are filled, they can be moved through a watering tunnel and tagging machine before being transported to the greenhouse. Additional workers are needed for these operations. 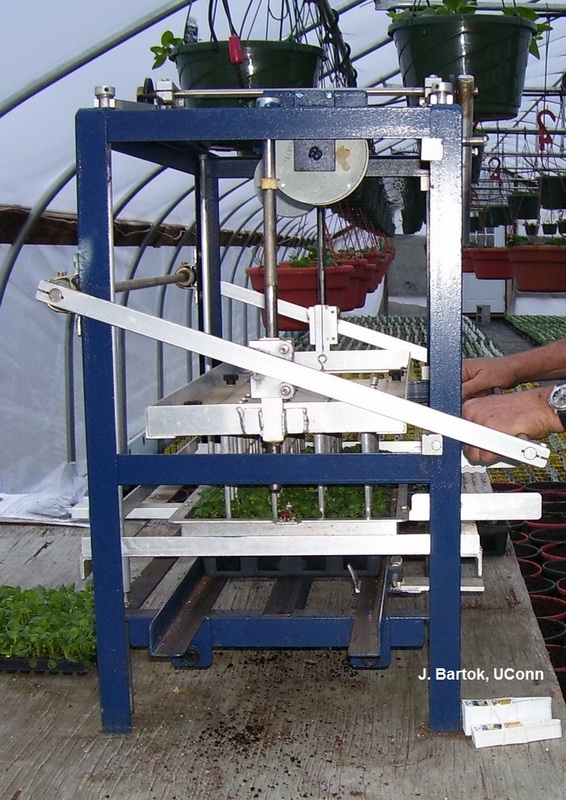 The concept of this machine is to push (punch) seedlings through the bottom of the plug tray into the transplant flat below. It uses stainless steel push rods aligned and configured to the flat below. Indexing the plug flat allows all the plugs in the flat to be transplanted. The manual version operates with a hand lever. The semi-automatic model is electric powered. A belt conveyor is available to position and remove the flats to save time. Manufacturer of transplanter in photo is Blackmore Company, Inc. www.blackmoreco.com. The automatic transplanter is the last major piece of equipment developed to improve efficiency in ornamental production. Once growers switched to growing plugs, the transplanter was a viable device. Uniform size seedlings and root balls are required to allow handling with mechanical devices. The use of an automatic transplanter increases production without additional help. It also allows you to refill greenhouse space quickly during the shipping season thereby keeping the growing space full. In some cases this could result in an additional crop from the space and help to pay off the cost of the machine in a shorter time. Plugs transplanted with an automatic transplanter are usually more uniform than those planted by hand. This is due to the accuracy of the equipment. If adjusted correctly, all plugs are placed at the same depth. 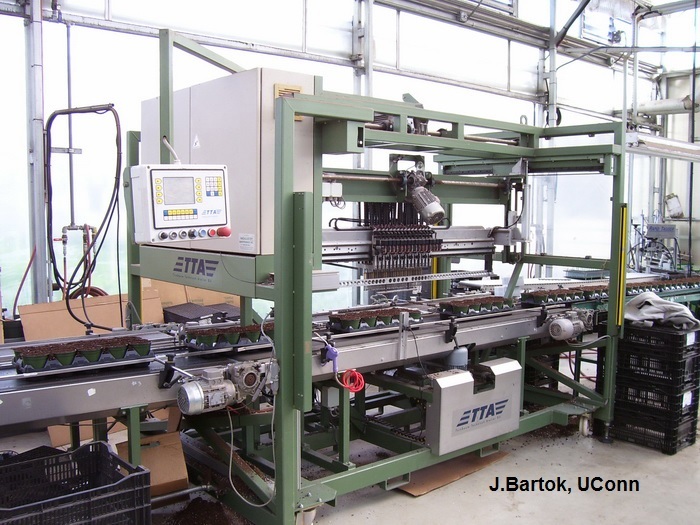 Most automatic transplanters will handle different sizes of plug flats and trays. For some it is a matter of making changes on the computer. Others require physical changes to the spacing of the grippers. A couple of machines are designed to handle only a specially designed flat with fixed cell spacing. Although the transplanting operation is automated, the process still requires people to supply plug trays and removed planted flats. Depending on machine, it could take from one to four people to operate. The speed of operation also varies considerably between manufacturers and also models. The slowest machines will plant about 2200 plugs/hr. whereas the fastest will do up to 25,000 plugs/hr. The basic automatic transplanter contains a plug tray feeder, transplant flat conveyor, transplanting station, conveyor to remove the planted flat and a control panel. Other accessories may be added or required including a dibble, plug extractor, vision sorter, water seating nozzles and photo sensors. Plug tray feeder - Most manufacturer’s use a belt conveyor for moving the plug trays to the transplanting station. This may feed one or more trays at a time. Transplant flat conveyor - One or more flats wide are carried on a belt conveyor under the transplanting station. Flats can be hand loaded or fed directly from a flat filling machine. Transplanting station - At the transplanting station, the plugs are removed from the plug tray, spaced and planted into the transplant flat. Several types of devices are used to remove the plug from the tray and transfer it. Improvements continue to be incorporated. Amount of time and effort to change from one size flat to another? What utilities are required? Electricity, water, and compressed air may be needed to operate the transplanter. What size power supply is needed? Will this be available if the machine is moved from one greenhouse to another? Some machines have an integral compressor, others can use a central source. Do you need a machine with a vision system for selecting good plants or are your plug trays near 100% perfect? Warranties vary from 4 months to 2 years depending on the manufacturer and the complexity of the equipment. How convenient is the control system? Is the computer program menu driven? How many flats/day are required to meet your production schedule? Will the machine handle overgrown or root-bound plugs? These can cause problems with many machines. Do you need to have the machine mobile? Moving the machine between growing areas may increase efficiency if you have many separate greenhouses. A fixed container filling and transplanting area may be more efficient for a gutter-connected range where plants are transported by conveyor or carts. Does the transplanter require the use of special flats or a match between the configuration of the plug flat and the transplant flats? Some machines require that plugs be in a straight line in the flat. Others require that the number of cells in the plug flat be a multiple of those in the transplant flat.